The American paddlefish is one of two living species of paddlefish and can grow in excess of five feet and weigh more than 60 pounds. The most distinguishing feature on the paddlefish is its rostrum, or snout, which it uses to find food. 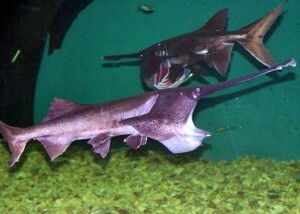 The American paddlefish lives in large rivers with deep, slow-flowing water. Typically, paddlefish live in freshwater, but they can survive in brackish water. Its range is the 22 states that make up the Mississippi river drainage. Females are fully mature at 12 to 14 years, and males reach maturity at six to seven years. They are believed to have a live expectancy of 50 to 55 years. The rostrum (snout) is lined with electrosensors that help the paddlefish locate phytoplankton. In addition, the structure itself helps the paddlefish remain on course when feeding.